If he’s not the best catcher of all-time, he’s certainly the winningest catcher in the history of baseball. Yogi Berra is a 13-time World Series champion as a player, manager and coach. Berra is one of only five players to win the American League MVP three times and is an 18-time All-Star. Berra was named to the MLB’s All-Century Team and was inducted into the National Baseball Hall of Fame in 1972. Berra’s No. 8 is retired by the New York Yankees franchise. On the back head strap is the Spalding manufacturer’s tag. 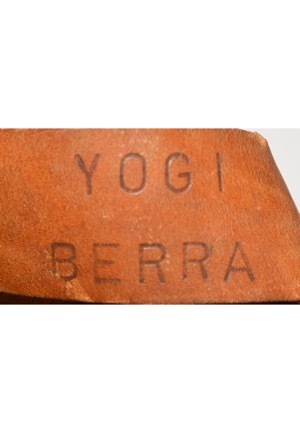 Adjacent above on this tag is the model number “1514” and “YOGI BERRA” stamped onto the leather strap. Berra signed on the front of the mask on top in blue ink and in our opinion the signature rates a 6. 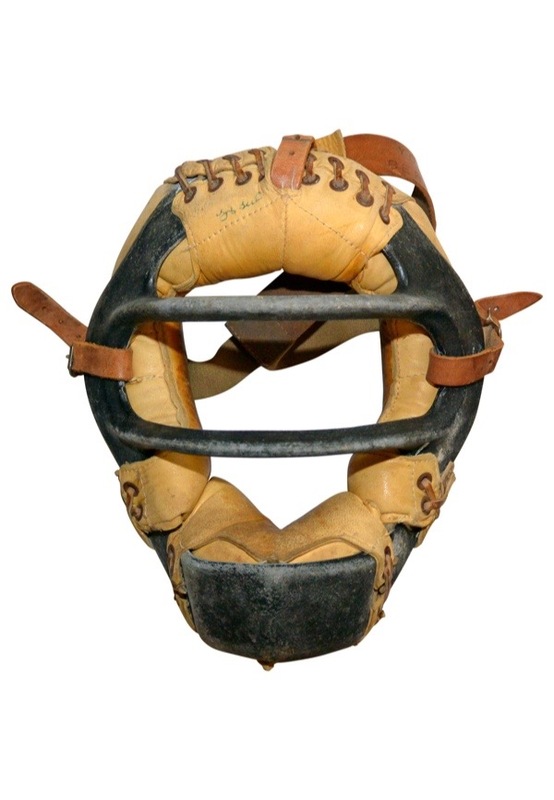 This catcher’s mask is properly tagged and stamped, was presented to us as game-used and in our opinion shows outstanding use. Accompanied by a Full JSA LOA a Berra LOA.